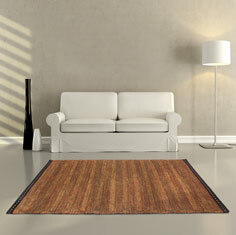 The use of precious natural elements make our Bombay rugs unique and very attractive. These elegant flat-woven rugs are woven lovingly by hand, they spray a fascinating atmosphere around your home, adding to a relaxing natural comfort. The restrained stripes impressed by alternating structures, while the warm colours look very comfortable and inviting. Go with the zeitgeist and beautify your home with a unique natural colour, texture and material. Please note slight differences due to the handmade production may occur.